The Isarco Valley is undoubtedly one of the most beautiful places in Central Europe to experience the annual spring awakening. While the rugged mountains surrounding the village of Naz with their snow-covered peaks still send last winter greetings into the valley, the lowlands around the Pension Auerhof already shine in light green. However, not for long, because soon the entire region of South Tyrol will be covered in another white veil – which, however, is not made of snowflakes. 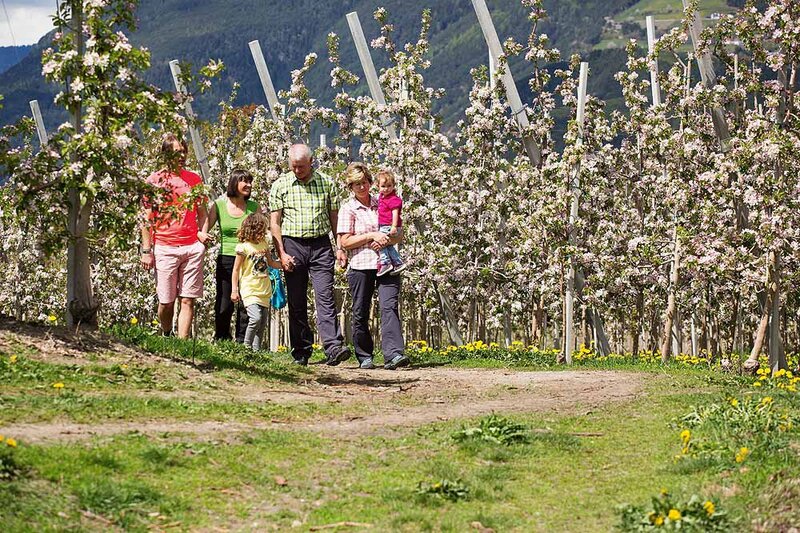 Every year, starting from April, a vacation in Naz is a truly blissful experience, because in South Tyrol the time of the spring bloom starts and transforms the entire Isarco Valley – especially the famous apple plateau – into a beautiful Garden of Eden. 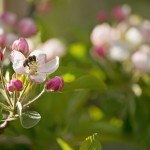 On nearly 20,000 acres of apple orchards, during the spring awakening hundreds of thousands of apple trees are covered with 17 million tender, red and white flowers, which will produce about five million apples. Thus, the region of South Tyrol is also known as the largest orchard in Europe. 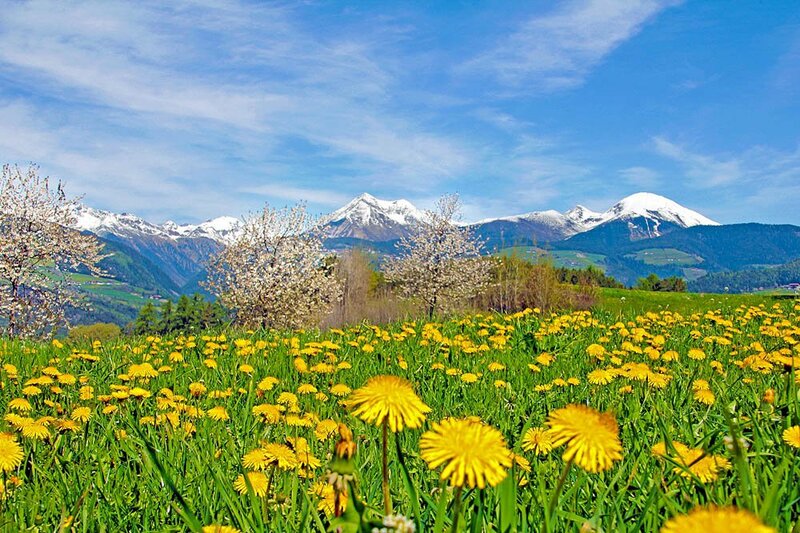 The spring in the Isarco Valley is usually mild, and the first spring flowers bloom in March. However, in case the temperatures fall again, the farmers shower their trees with water, which freezes during the night and turns into protective ice shield that envelopes the flowers. When the sun rises on the next morning, thousands of sparkling ice flowers glitter on the branches. Discover the gorgeous flower landscape, populated by bees and butterflies, during a long hike or a leisurely bike ride. The theme trail “Flower Hike” takes you through the most magnificent gardens and meadows, while the newly created Nordic Walking & Running Park during the spring awakening in Naz offers plenty of scenic highlights on a total length of 40km. 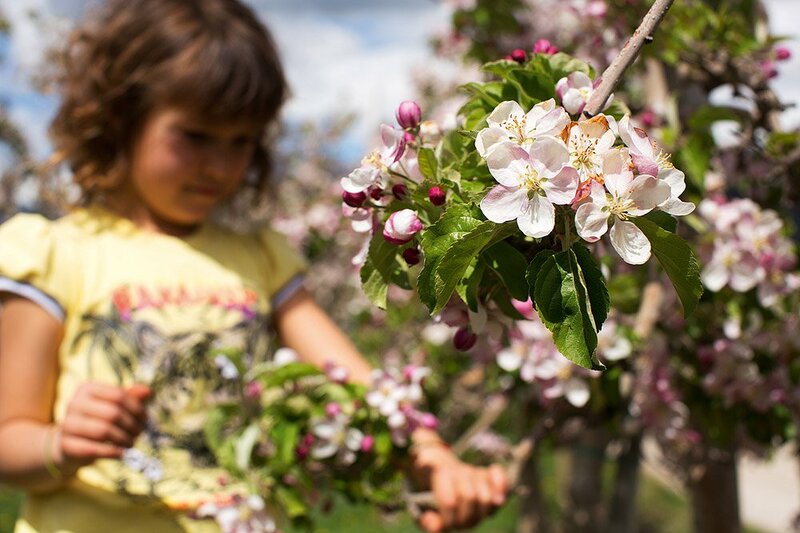 DEvery year, thousands of tourists come to the region to admire the magnificent nature spectacle in the Isarco Valley; the event reaches its peak in the traditional Apple Blossom Festival, which transforms the region around Naz/Sciaves into the vibrant centre of the apple blossom. From all parts of South Tyrol, people flock into the flourishing Isarco Valley to celebrate the spring awakening in Naz with singing and dancing, and colourful processions and parades. The highlight of the festivities is the crowning of the apple queen and numerous events during the varied entertainment programme. Tourists will particularly enjoy the typical South Tyrolean costumes with their lavish embellishments and enjoy their spring vacation to the fullest.